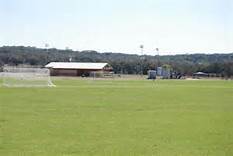 An abundance of recreational and sports amenities make Bulverde/Spring Branch a great place to live and visit. The Park is open daily from 6 a.m. to 11:00 p.m. All park amenities are available on a first come, first served basis, unless a reservation has been made. 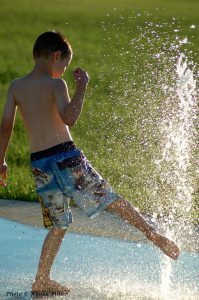 For more information or to make a reservation, please visit their webpage at http://www.bulverdetx.gov/168/Bulverde-Community-Park. Kleck Park was donated by the Helena Kleck Vivian Living Trust to Comal County on March 6, 2014. It is a total of just over 43.5 acres and features three looped walking trails for a total of just over 1 mile of trails. 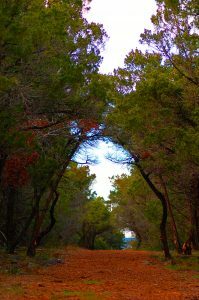 The trails are covered with native mulch and provide a stunning view of the natural hill country beauty. Drinking water is not available, so be sure to bring plenty of water as you enjoy this beautiful gift. Guadalupe River State Park is located along the boundary of Comal and Kendall counties. The state acquired the property from private owners in 1974. The park opened in 1983. The clear-flowing waters of the Guadalupe River bisect the park. Ruggedness and scenic beauty characterize this slice of the Texas Hill Country. With four miles of river frontage, the Gua­da­lu­pe River is the park’s most out­stand­ing natural fea­ture . 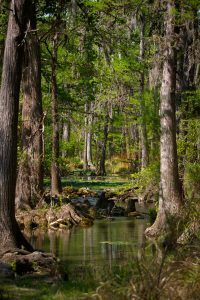 Imposing bald cypress trees line the banks. On its winding path through the park, the river courses over four natural rapids. Two steep limestone bluffs reflect the river’s erosive power. On the river, you can swim, fish, tube and canoe. While on land, you can camp, hike, ride mountain bikes or horses, picnic, geocache, and bird watch. They alos loan fishing gear for use in the park. For more information, please visit the Texas Parks & Wildlife’s website at https://tpwd.texas.gov/state-parks/guadalupe-river. Entry into Honey Creek is by guided tours only. The diverse geology, flora and fauna make Honey Creek a special place for all visitors using two miles of nature/interpretive trails. For more information, please visit the Texas Parks & Wildlife’s website at https://tpwd.texas.gov/state-parks/honey-creek. 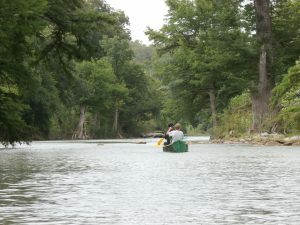 For more information, please visit the Texas Parks & Wildlife’s Texas Paddling Trail website at https://tpwd.texas.gov/fishboat/boat/paddlingtrails/inland/upper_guadalupe . Established in 1971, Guadalupe Canoe Livery offers six canoe, kayak, raft, or tube trips on the Upper Guadalupe River above Canyon Lake from FM 3351 to Rebecca Creek Road. 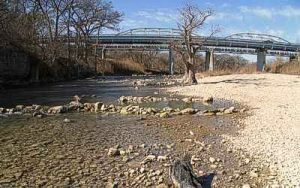 The Upper Guadalupe River is about 15 degrees warmer than the Lower Guadalupe River below, which gets its water released from the bottom of Canyon Lake Dam, plus it is not under any of the New Braunfels restrictions. 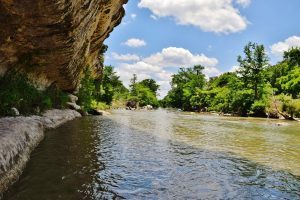 Enjoy floating the Beautiful Upper Guadalupe River as it twists and turns through private property and the Guadalupe River State Park. This 23-mile stretch of river has several Class I & II rapids and waterfalls and is part of the Nichol’s Landing Padding Trail. In addition, the campground established in the 1930s has become a local icon offering fishing, picnicking, swimming (day use), along with tent camping, and RV site hookups. Enjoy, relax, and/or float the beautiful, upper Guadalupe river. For more information, please visit their website at http://www.guadalupecanoelivery.com. Canyon Lake is the gem of Comal County and the Central Texas Hill Country. 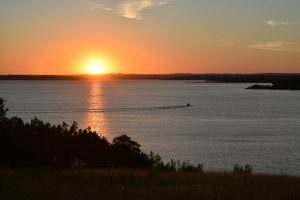 With breathtaking waterfront and lake views, Canyon Lake has so much to offer such as Boating/Sailing, Water Skiing, Kayaking, Fishing, Scuba Diving, Helicopter Tours, Parasailing, Hiking, Dining, Shopping, and much more. Canyon Lake has eight Corps of Engineer Public Parks, 23 boat ramps, two marinas, campgrounds, golf course, country club, and yacht club. The lake has a surface area of 8,230 acres and 80 miles of shoreline. Canyon Lake releases water downstream into the famous Guadalupe River. For more information, please visit the Canyon Lake Chamber of Commerce & Visitors Center website at https://www.canyonlakechamber.com. The Canyon Lake Gorge is a natural geological wonder evolving from the historic flood of 2002 that sliced open the ground below the spillway of Canyon Lake, creating a gigantic 64-acre Gorge and exposing ancient, cretaceous limestone, fossils and even dinosaur footprints 110 million years old. The Gorge highlights the Hill Country geology and the exposed Trinity Aquifer, clearly showing faults, fractures and seeps in the limestone. Limestone layers created from an ancient sea are visible, and visitors admire waterfalls and springs where the aquifer is exposed. The Canyon Lake Gorge is open to the public for guided tours only. Each 3-hour tour is led by a volunteer certified Gorge Preservation Society Guide with assistance from trained Docents. For more information on the Canyon Lake Gorge or to schedule a tour, please visit their website at https://canyongorge.org. 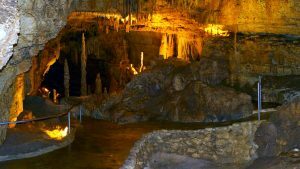 A premier natural attraction,the Natural Bridge Caverns are the largest known commercial caverns in the U.S. state of Texas. The name is derived from the 60 ft natural limestone slab bridge that spans the amphitheater setting of the cavern’s entrance. For more information, please visit the Natural Bridge Caverns website at http://www.naturalbridgecaverns.com. The Bracken Bat Cave is home to the world’s largest bat colony. 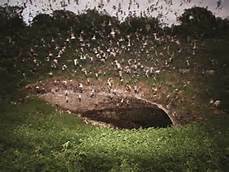 An estimated 20 million Mexican Free-tailed Bats roost in the cave from March to October making it the largest known concentration of mammals. Be there as millions of free-tailed bats spiral out of Bracken Cave and take to the skies on their nightly hunt for insects, in a truly awe-inspiring reminder of how amazing nature can be. For more information, please visit the Bracken Cave webpage on the Bat Conservation International website at http://www.batcon.org/our-work/regions/usa-canada/protect-mega-populations/bracken-cave. One of Texas’ most recognized family entertainment attractions. Experience a real African Safari as you meander through 450 acres of rolling hills, creek beds, and magnificent live oak trees and witness the behavior of over 500 animals from 40 exotic, native and endangered animal species worldwide. 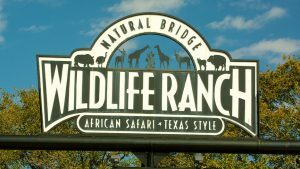 For more information, please visit the Natural Bridge Wildlife Ranch website at http://www.wildliferanchtexas.com. The museum has over 200 dinosaur tracks and 28 separate trackways made approximatly 110 million years ago. They are a part of the upper Glen Rose Formation of the early Cretaceoues period. 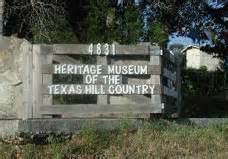 The Heritage Museum of the Texas Hill Country is a multi-acre layout located midway between Startzville and Sattler on FM 2673. For more information, please visit their website at http://www.theheritagemuseum.com. Schlitterbahn New Braunfels is the original water park resort. Deep in the heart of central Texas, Schlitterbahn grew out of the spring fed river and German heritage of the Hill Country. With an eclectic resort, and two distinct waterpark experiences with 51 attractions over 70 acres, it’s easy to see why New Braunfels is Schlitterbahn’s flagship location. 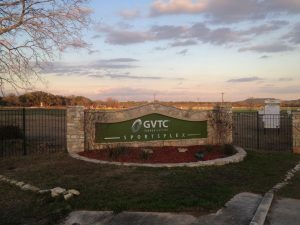 ​The facility is owned and managed by World Wide Soccer LLC and GVTC Communications scored the naming rights in January 2013. GVTC Communications continue to support the local community through the GVTC Foundation. The Sportsplex welcomes hundreds upon thousands of soccer families, as well as multi-sports and many other youth and adult recreational organizations alike. For more information, please visit their website at http://www.worldwidesoccersa.com. Spring Branch Youth Football Assoc. River Crossing Club is a premier Texas Hill Country private golf club nestled in the rustic beauty of the Texas Hill Country in Bulverde/Spring Branch. A limited amount of outside play is welcome until the membership level reaches a predetermined level. Panoramic views, excellent golf course conditions, and the park like atmosphere all contribute to a true retreat from the outside world! For more information, please visit the River Crossing Golf Club website at http://www.rivercrossingclub.com. The Club at Rebecca Creek is an 18-hole par 72 golf course. Designed by George Hoffman, it plays 6,863 yards from the tips. It is nestled in the beautiful Texas Hill Country with oak-lined fairways and gently rolling terrain. It is one of the most impressive golf clubs in Texas with well-maintained greens, economical green fees, beautiful landscaping, welcoming staff, delicious food, family-friendly activities, pool, clubhouse, and pro shop. For more information, please visit the The Club at Rebecca Creek website at http://rebeccacreek.com. 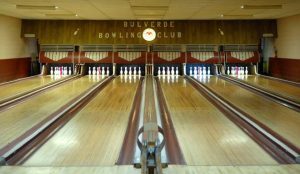 Bulverde Bowling Club is a member of the Tri-County 9-Pin Bowling Association. Inner-club trophy bowling competitions are held twice yearly. Only 4 counties in the United States have nine pin bowling and we have one right here in Bulverde! For more information, please visit their Facebook page at https://www.facebook.com/BulverdeBowlingClub. 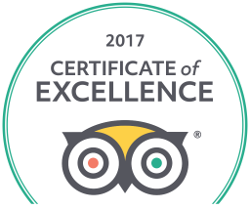 Sixty Equestrian Center is an English riding school specializing in dressage and hunter style jumping. It is open seven days a week and is fully lit for evening and early morning lessons. The Riding School is 4 miles east of Highway 281 – 4 miles west of FM 3009 located on FM 1863 in Bulverde Texas. For more information, please visit their website at http://www.sixtyequestriancenter.com. 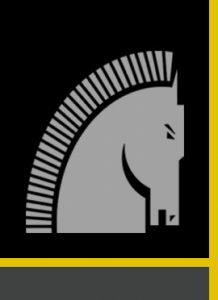 Established in August 2004, Doringcourt Stables, Training Center & Exotics opened its boarding stables. They are nestled in Bulverde, Texas between FM 1863 and Hwy. 46 on Smithson Valley Rd., just ten miles north of San Antonio, Texas in a beautiful setting for an afternoon ride or pens designed for a workout lesson or training for a big event are on site. They have two 66’ lighted round pens, a 90’ X 225’ arena, shed row to include individual tack rooms. For more information, visit their website at https://www.doringcourtstables.com/home. This unique facility in Bulverde/Spring Branch is a one-stop-shop for Obstacle Course Race Training (OCR-X) located on approximately 25 acres in the Texas Hill Country just 11 miles north of the San Antonio City Limits in Spring Branch. The Green Mile Obstacle Course is a 1.75 mile course with 50+ obstacles to challenge any fitness level and a 3,000 sq. ft. Ninja-Warrior Training Center. For more information, please visit the Power Park Fitness website at http://www.powerparkfitness.com/ppf-home. Bulverde/Spring Branch also boasts a variety of traditional fitness clubs, CrossFit facilities, dance academies, gymnastics studios, and personal trainers.